The most successful coach in college basketball will be sharing his wisdom with local high school and youth coaches at the Bob Carpenter Center in Newark, DE, on September 11. Connecticut women’s basketball coach Geno Auriemma, who also prowls the sidelines for the U.S. National Team, will hold a chalk talk session courtesy of Slam Dunk to the Beach at the Carpenter Center before his American team plays an intrasquad scrimmage in the First State that night. The event, which was organized by the Delaware Sports Commission (the governing body of Slam Dunk to the Beach), is just another example of the organization’s commitment to top flight high school basketball in the state of Delaware. It is free to any coach who wishes to attend, as long as they have a ticket to that night’s U.S. National Team’s game. The clinic will include access to the Americans’ shoot around, as well as a reception at Grotto Pizza on Main Street after the clinic is completed. Coaches can sign up for the clinic by visiting Eventbrite.com (https://www.eventbrite.com/e/usa-basketball-womens-national-team-shoot-around-and-chalk-talk-w-geno-auriemma-tickets-12581318061). Auriemma has coached the University of Connecticut to a women’s NCAA record nine national titles (1995, 2000, 2002-04, 2009-10, 2013-14), recorded five undefeated seasons (1994-95, 2001-02, 2008-10, 2013-14), and most recently led his 2013-14 Huskies to a perfect 40-0 record, marking a NCAA record nine-consecutive 30-win seasons, and the 2014 NCAA title. His resume further boosts induction to both the Naismith Memorial Basketball Hall of Fame (Springfield, Mass.) in 2005 and the Women Basketball Hall of Fame (Knoxville, Tenn.) in 2006. 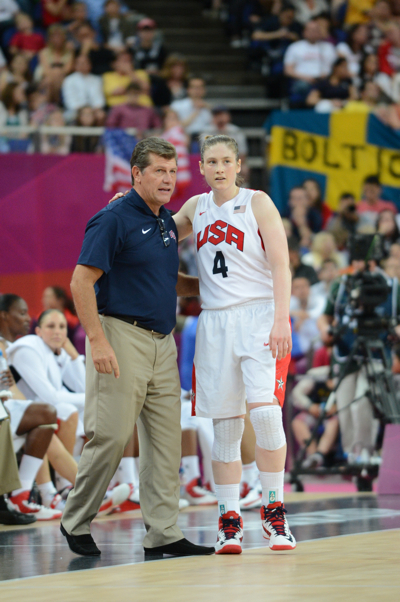 Auriemma also led the U.S. National Team to a 2010 FIBA World Championship and a gold medal at the 2012 Olympic Games. He has strong local ties to the Delaware Valley, settling in Norristown, PA as a youngster after his family came from Italy to America, and then attending West Chester University. Auriemma’s U.S. National Team Assistants, along with the staff of the NBDL’s Delaware 87ers will also be on hand for the Chalk Talk Session. Dawn Staley highlights that group. The current head coach at the University of South Carolina, Staley also has strong local ties. The Philadelphia, PA native was named USA Today National High School Player of the Year in 1988, and then returned to the region to spend eight seasons as head coach at Temple University, where she led the Owls to their first ever Atlantic 10 conference championship and six NCAA Tournament appearances. Her playing career was so noteworthy that Staley is one of just 27 individual women to be enshrined in the Naismith Memorial Basketball Hall of Fame and just the 15th female player to go in on her individual merits. DePaul University head coach Doug Bruno, 87ers head coach Rod Baker and his assistant Kevin Young will speak as well. With this event, Slam Dunk to the Beach has started that process of enriching the game in the First State and serving Delaware’s students, three months before the tournament even makes its triumphant come back. The return of the renowned Slam Dunk to the Beach basketball tournament will be held at Cape Henlopen High School from December 27-29, 2014. The field is headlined by several schools who annually occupy spots in the national rankings. Sunrise Christian Academy (Wichita, KS), Our Savior New American School (Centereach, NY), Gonzaga College High School (Washington, D.C.) and Ss. John Neumann-Goretti High School (Philadelphia, PA) will all spend their winter break in the First State. Fourteen teams—representing seven states and the District of Columbia—will be competing in this year’s event, with two remaining teams to be announced later this month. A limited number of three-day tournament tickets are available during a special presale to celebrate the return of this much-anticipated hardwood spectacle. For more information, or to purchase tickets, visit https://slamdunktothebeach.com/tickets/ or follow the tournament on Facebook at Slam Dunk to the Beach or via twitter under the handle @SlamDunkToBeach.